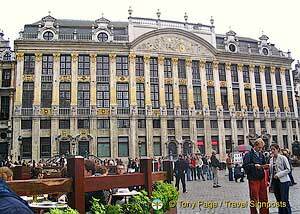 Accommodation and Places To Stay In Brussels - Hotels, B&B's, Hostels and Apartments. Accommodation and Places To Stay In Brussels - Hotels, B&B's, Hostels and Apartments In Brussels To Suit Every Traveller and Budget. Whether you’re looking for a luxurious five star where you can be pampered and enjoy fine dining, or you’re looking for a cheap place to squat, you’ll find something to appeal to you in Brussels. The city is peppered with hotels and hostels – you only need to determine how much it is you wish to spend and how close to the heart of the city you wish to stay. The Brussels tourist office (www.brusselsinternational.be) provides a full listing of accommodation. There are clusters of Brussels hotels and other various accommodation dotted around Grand Place, the upper and lower towns, the EU district, St Gilles and various other locations. So what type of prices can you expect to fork out? For very basic accommodation it’s possible to secure a room for under 80 euros, while at the other end of the spectrum you can splurge 400 Euros or more for more opulent surroundings. The latter tend to offer plush services including 24 hour room service, state of the art fitness facilities, business areas and even baby sitting services. Generally, the city has a good reputation for providing good clean rooms and fair service at all price levels. Some of the lower end hotels do not provide in-house eateries (they tend to offer breakfast but that’s it) although the glut of cafes and restaurants spread throughout the city means this is not a major drawback. In fact it’s a plus as it gets you out to explore the city. Fussy travellers will find places to stay that cater to their individual tastes – you can enjoy hotels offering splendid vistas (such as the exquisite Amigo along the lower town) while Welcome for instance is known for it’s interesting architecture. Gourmet lovers can visit Radisson SAS which has a 2 Michelin Star restaurant. There are a couple of notable BandB’s in Brussels such as Taxistop Bed and Breakfast and tourists on a strict budget can reserve a room at the tourist office. There are also hostels for those who wish to spend even less – with private rooms available for as little as 20 Euros. If you’re planning to visit Brussels during its peak times then be smart and book your accommodation ahead of arriving. As you might expect, places become very full during these times and you may not get the hotel or location of your choice unless you plan ahead. Sometimes, it’s possible to secure weekend discounts or get Eurostar hotel and train deals from various places in Europe including England. It’s also possible to secure private apartments to rent within Brussels – expect to pay anything between 300 to 1000 Euros per week depending on the type and location of the property you wish to rent. Below is a brief listing of accommodation – various hotels and other places to stay according to location.